Have you heard of 3d printing? The two magical words have been revolving around in the tech arena for quite a while now. Honestly, not even techies don’t know what exactly those mean. Are you one of them? Do you know what 3d printing is, let alone 3d printing pens? Don’t worry! I am going to guide you through all these. In case you are specifically looking for the best 3d printing pens, you are free to skip these introductory sections and read directly the listing. As I said earlier, I want you to know at least what 3d printing is. So let’s just move on to the basics. The name says it all. In usual printing, we do embed shapes and texts onto the paper in two-dimensional form. You can’t pull it out from the surface of paper. Length and breadth are the two dimensions such thing has. On contrary to what you read above, 3 D printing fetches real objects without the help of the surface of a paper. Means, you can easily hold the shape in your hands. Just like 2D paper printers, there are 3D printers, which you can buy (but you need to shell out more bucks). In order to get a shape printed in 3D, you have to design it virtually using software like AutoCAD and then provide print command to get it done. 2. What is 3D Printing Pen? As you read just above, 3D printing involves two steps; design and printing, of which the former is more complicated than the latter. You need to spend quite some time to get your shape into absolute perfection.What if I give something that can transform your drawing into the real 3D item? Will you be interested in it? Well, the solution is a 3D printing pen. Yeah, you read it right! A pen that creates 3D sculptures like a walk in the park. 3. How does a 3D Printing Pen Work? Are you impatiently waiting for the best 3D printing pens? Just skip this section and, you will get there. In case you are new to this whole 3D printing stuff, I recommend you should read this one. A 3D printing pen’s working is more or less similar to that of a normal pen. How does a normal pen work? You just hold it in your hand, make a contact between the nib and paper, then finally, you move your hand in such a way that the end result depicts your idea. The same goes on with 3D printing pens as well. Yeah, I am not exhilarating anything. The only difference remains in the ink it uses. Unlike the normal pen, 3D printing pens use liquid plastic as ink. In practical, you just insert plastic in solid form and it is the inner heating mechanism that converts it into liquid. Due to the innards, the product is a little bit heavier and bulkier than ballpoint pens. Once you set everything right, you can pour your idea right from your mind into a sculpture like a skillful artist. All you need is creativity and a pool of ideas. I hope you now got at least a vague idea of what a 3D printing pen is. Next, we are getting deep into the real business; top 10 3D printing pens for 2019. I have handpicked ten of the best products from Amazon. Under each title, you can read a brief description about it. 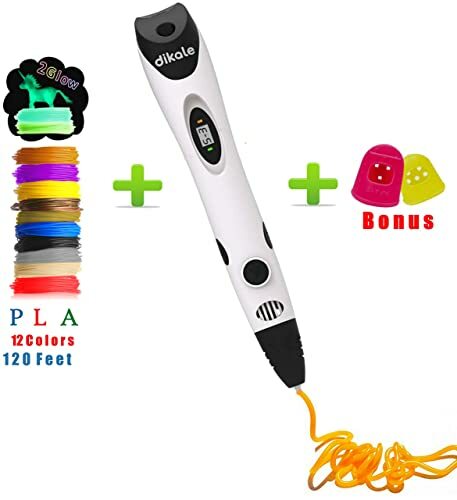 The Dikale 3D printing pen claims to provide guaranteed satisfaction and finest performance. This newest technology is made from premium quality material and has finest features. The sleek and slim design makes it portable and lightweight; the nozzle is made of ceramic that prevents clogging. This ultra slim 3D pen comes with high quality and is available at an extremely low price. It can be a great gift for a loved one, plus if you are not satisfied with the quality you can return and get a full refund without any hassle. 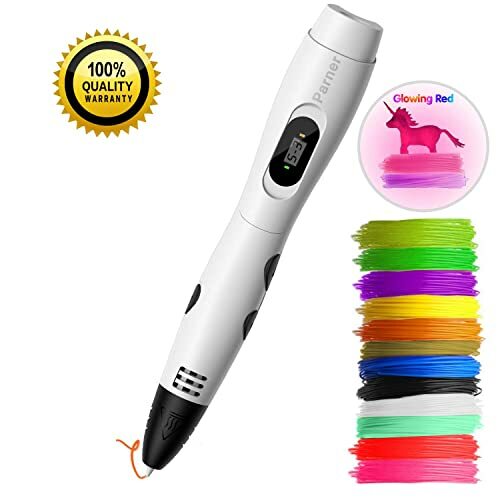 If you are looking for a 3D printing pen that doesn’t leave you exhausted while writing then this ought to be the right choice. The lean and improved design ensures the speed is kept under control without making you feel tired. Regular pens leave you fatigued after long designing or drawing, however, this pen will let you work for as long as you want to. These amazing 3D pens are made from either PLA or ABS material; the filament can be removed automatically by double-clicking the loading and unloading button. Unlike ordinary pens this pen will never get clogged, ceramic nozzle pens are best as there is no danger with them, however, the pens with a copper nozzle can be unsafe around kids as copper conducts heat easily. If you are new to 3D printing pen then this isn’t your thing because this pen requires some practice. If still, you want to get it then it’s advised to work under experienced person supervision. It can be a great gift for adults and kids. This smart looking 3D printing pen is extremely convenient and secure. Unlike other pens, it supports mobile power supply, at times when you want to use a 3D printing pen but is not able to find a power outlet don’t panic, because it can use mobile power. With the KT-PRASE pen, you don’t have to stop working on your imagination, it let you design and draw for as long as you want. They are made from ABS or PLA, which makes these pens one of the best 3D printing pens available on market. Almost 1.75mm of PLA filament is enough for this pen, the best thing about PLS filament is that it is odorless and non-toxic. It is one of the most widely used pens that is regarded as safer as compared to other pens. The printing speed is great and is pretty controlled allowing you to work for hours without getting tired. The slim design and light weight make it easy to carry around. You can increase or decrease the speed according to your requirement; it is convenient for a variety of operations. You can adjust the temperature of this amazing pen; it allows you to adjust the temperature from 60C to 245C. There is an OLED display that gives you a track of the current temperature, by looking at the existing temperature you can easily do fine-tuning. 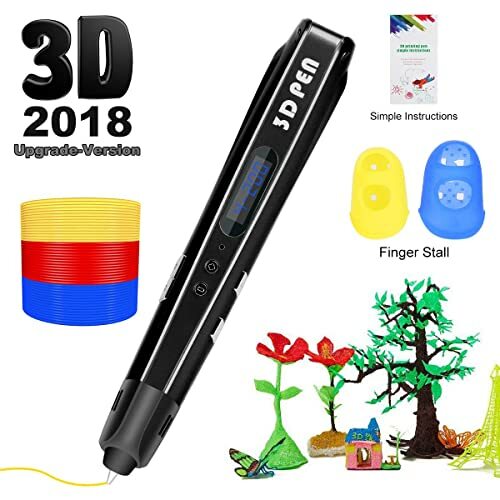 If you want an easiest to handle 3D printing pen then this is it, the ergonomically devised pen is perfect for designing 3D art for children’s play. Unlike other pens it is simply controlled using one button, just click the button, the ceramic nozzle releases the desired amount of filament and there you go. To pause it click the button again, if there is no activity for more than two minutes then the pen automatically sleeps. If you plan to learn how to use this pen with the help of the instructions mentioned on the manual, then here’s a reality check that this is not happening. The guidelines are pretty complex; you’ll need someone to help you use this pen. 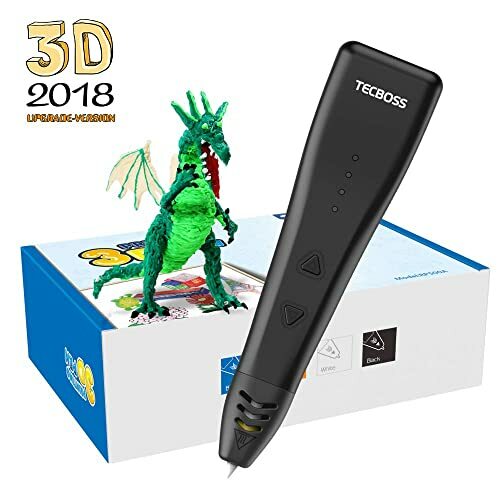 Everyone wants a reliable and a precise pen, Tecboss 3D printing pen is efficient and is equipped with outstanding features that can help you bring your imagination to life. If you want someone to improve their dimensional and spatial ideas, you better gift then this pen. Its PLA filament comes in five different colors and allows you to doodle and sketch three-dimensional objects. Moreover, it’s a stress release for grownups, by using Tecboss 3D printing pen you can cultivate your creative side and interests while leaving behind your worries. Other than that it is efficient and easy to use, only one button control is required for writing or drawing. Allows you to adjust the speed with the help of the speed control, you can make the filament flow slow, fast or moderate according to your interest. Keep the design in your mind and set the speed according to it. Apart from that, it is both user and environment-friendly; this pen has a good compatibility with just PLA. The filament of Tecboss 3D printing pen is made from completely organic substances, for example, sugarcane and corn. It comes with a 12 months replacement warranty that gives the customer 100% satisfaction. With the pen, you will get a USB cable, manual, adapter, pen holder, PLA filament pack and drawing stencils. Make sure when the pen is heated you are supervising the kids as it’s really dangerous. If you are a beginner then try to have someone professional by your side during initial days. The Uvital 3D printing pen has a lot to offer, it helps in improving your creativity, attention to details and imagination. 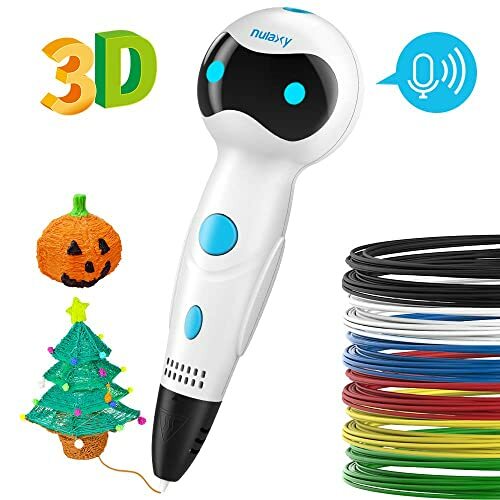 When looking for a 3D pen it’s important that the pen is safe and sound for kids, this pen can be exposed to a kid from an early age, giving an opportunity to learn new tools and skills. When they grow up these skills and an improved thinking helps them excel in life. They will not just get creative but will also develop great abilities. 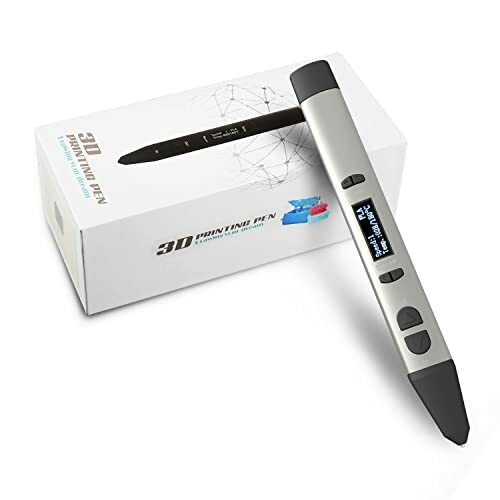 Furthermore, Uvital 3D printing pen is completely safe with no hot parts, you don’t have to worry about getting burned as the pen nozzle and plastic both are safe. All the important information such as speed, temperature etc can be seen directly on the LCD display. The material used to make the nozzle is aviation ceramic which is quite safe. It gives you a chance to explore your creativity and a chance to have a great deal of fun too. Apart from that Uvital pen is exceptionally environment-friendly; it is made from eco-friendly plastic, besides that the filament can be either made from PLA or ABS. The two material options make its operation versatile and smarter. It comes with a one year warranty plus if you are not satisfied there is an option of 30 days replacement or return. There are a lot of amazing features in this pen that will keep your content for long. The noise of the pen is a little disturbing; you cannot work with it while someone sleeping next to you. Apart from that, the extrusion of the filament is also not that quick. Apt for both kids and adults but make sure kids above eight years are given hold of it. Next is the stylish OOKU creative 3D printing pen, it’s a handheld creative device that helps you create and craft objects with ease. It comes with 1.75mm PLA or ABS filament; with it, you can bring your creativity to life by forming a stunning object. It’s very easy to use this pen as the design is quite simple, all you have to do is select the material of filament, plug in, switch on the power, heat up and there you go, create. There are a number of adjustable extrusion speeds, all of them are automatic, and you don’t have to worry about the speed of material flow. You can set the speed high, slow or medium according to your needs, besides that temperature setting is also simple. The design is simple yet elegant; it’s lightweight and is easy to carry around in your hands. As compared to regular 3D printing pens this one is not at all bulky and ensures your hand doesn’t cramp up. Additionally, the filaments come in three random colors and you also get a pen holder stand with it. Apart from that, a USB power cable is also included in the package; this helps you to use the pen while you are on a go. As compared to its competitors the material used to construct the pen is of low-quality. However, the performance is good but the exterior is not that up to the mark. If you are in a search of a 3D printing pen to practice doodling then Nulaxy Robot 3D drawing pen is a perfect choice. Unlike other 3D printing pens, this one comes with voice prompts; the pens allow you to improve your imagination, creativity, and spatial thinking. With it, you can turn your creative ideas into reality, apart from that it’s a way parents and children can spend some fun time together. Additionally, Nulaxy 3D printing pen is quite simple to use as you can easily control it with the help of two buttons. As compared to regular pens this one will not make you weary and your hand fatigued. All you have to do is press the button and start designing. It supports both ABS and PLA filament, moreover, this pen is comfortable to use. The speed of the pen can be managed easily, by double-clicking the function button you can change the speed of the filament. This stylish and easy to use pen comes with a protector that covers your index finger and thumb, the two finger protector prevents scalding during crafting and drawing. Some of the amazing features of this 3D pen are, voice feedback and change in robot’s eye color. This device is very easy to use, besides that it will automatically shut down after being on a standby for eighty seconds. At times the tip of the pen gets extremely hot that it needs to be taken special care of. Make sure you do not touch the tip when it’s hot. 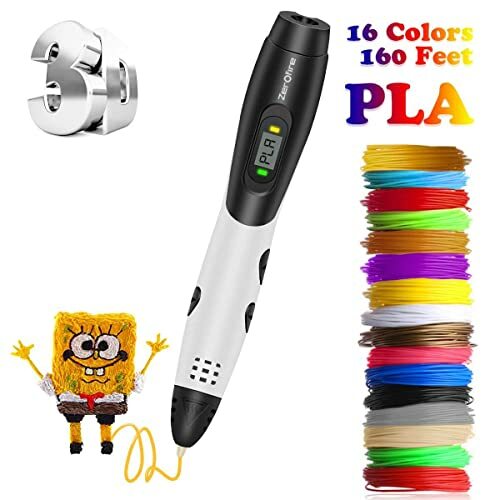 If you want a 3D printing pen that delivers quality then this is a good choice. It’s safe and quite easy to use, unlike ordinary pens it contains upgraded function, and there is only one button that does all the work, with just one click the pen loads the filament. If you want to upload the filament again press the button and the uploading will be done automatically. Not just it’s fun to use but this amazing 3D pen ensures your fingers remain relaxed. Both the speed and temperature are adjustable, there are three speed modes; low, medium and high. Besides that printing temperature modes are also three, you can select the suitable mode according to your drawing proficiency. The speed is clearly displayed in the advanced LCD screen. Parner 3D printing pen is compatible with both ABS and PLA filament. The PLA filament is available in 12 different colors and the size of each filament is 10 feet. In addition to that, the pen can be charged by various power banks. Overall this pen is outstanding but the worst thing about it is that it has a short lifespan; you can only enjoy it for a short period of time. The brand should work on the durability of the device. 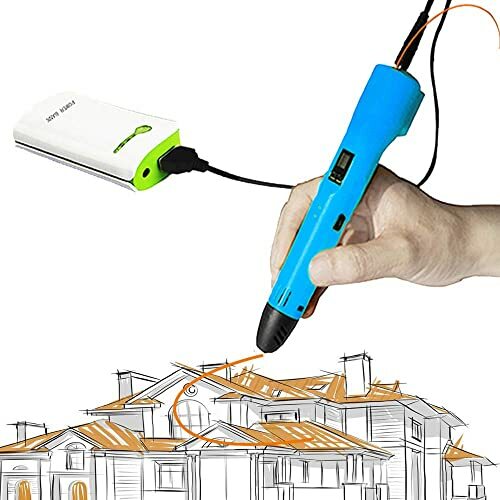 Zerofire 3D printing pen will help you bring your spatial thinking and creative ideas to reality. If you want to improve your or your loved ones thinking ability and creative imaginations then this pen can be of a great help. Apart from that, it’s a great way for parents to spend time with their children. Most of the 3D printing pens either support ABS filament or PLA filament however Zerofire pen is compatible with both of these filaments. It supports drawing is the easiest way and it also has a speed adjustment feature. 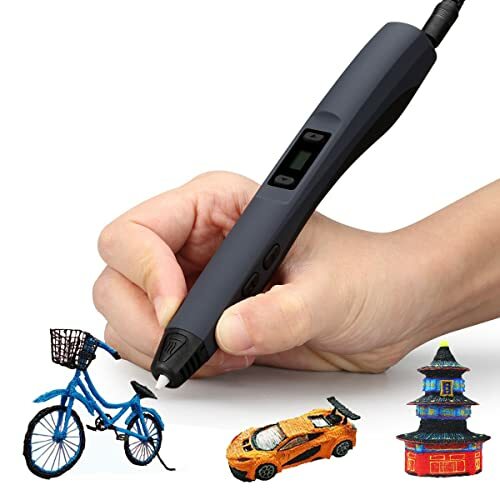 The LCD screen helps the user to see the speed and temperature of the filament, which allows the user to take control of the pen without difficulty. It’s really easy to use a Zerofire pen, all you need to do is heat the pen by plugging it into the USB port, once the status indicators go green from red attach the filament in the hole and press the control button, you’ll be ready to craft. You can charge it using your laptop, computer or any other power bank. This stunning pen comes with sixteen filament refill of sixteen different colors. Besides that, the package has a power adaptor, pen holder, pen, removal tool, manual and a USB cable. Everything is good about this pen except the fact that the extrusion of the filament is pretty slow. Apart from that the clogged nozzle also hinders in your creativity. Mika3D printing pen is considered one of the best 3D printing pens available on the market. It comes with a copper nozzle that ensures the feeding of the PLA filament is smooth. Moreover, the copper nozzle prevents the filament from getting stuck and creating problems while drawing. However ceramic nozzle is safer than the copper nozzle while using the Mika printing pen make sure you do not touch the metal nozzle when it’s hot. This pen has a big LED screen that shows a number of things such as printing temperature, speed, and the printing material. The LED screen helps in creating 3D object much more easily and creatively. Its design is elegant and super slim; the well-designed pen has an attractive metal body. The flexible design helps in preventing fatigue and allows you to work comfortably for longer hours. You determine the speed that suits you as it comes with five different speed options. You can adjust the speed according to your needs and create gorgeous 3D art objects. Unlike its competitors the unclogging process is not that easy, it takes a lot of effort and time to unclog its nozzle. Sometimes the clogged nozzle prevents you from crafting your imagination with perfection. Let the imagination turn into reality with the help of slim and easier to handle Critiron 3D printing pen. The extrusion speed can be controlled easily for the endless creation and better operation. This pen is compatible with ABS and PLA filament refills which are 1.75mm long. The operation is very easy, simply click the button and select the type of material according to your requirement. It gives a stable performance and is an extremely convenient 3D printing pen. The design is quite intelligent and innovative, other than that it comes with eight-speed and temperature modes. 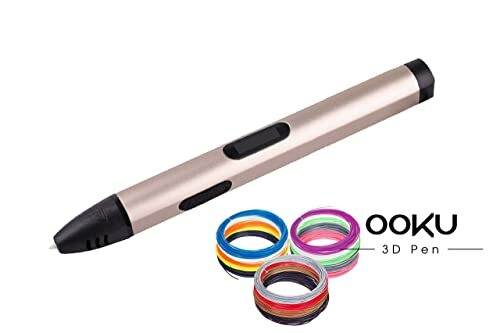 Apart from smart design, which is definitely better than the majority of the 3D pens, this device is also durable and reliable. On the whole, it’s an amazing pen but the fact that its lifespan is quite short is not digestible. It wears out after using it for a few times, the company should improve the durability of the product. You have got top ten 3D printing pens 2019. Now everything is up to you. But I can help you with the suggestion. Are you looking forward to buying a toy for your kid? Then, better you should buy a heat free, cordless pen. There are two of them in this list. If you want sturdiness, you must choose a pen that supports ABS. For hobbyists, PLA is enough as far as you don’t place in the sculptures in extreme heating conditions.